Apple introduced the world to Force Touch (more commonly known as 3D Touch on iPhones) in September 2014, and it looks like Android may be about to catch up... five years later. According to developer Till Kottmann, a new feature called 'Deep Press' has been added to the code for Google's next major installment of its mobile operating system, Android Q. The description provided by Google for the feature reads: "the current event stream represents the user intentionally pressing harder on the screen". That sounds an awful lot like the pressure sensitivity screen tech Apple has been using in the Apple Watch, MacBook trackpads and its iPhone range for years, and we've seen some Android manufacturers play with the tech in the past. In fact, the Huawei Mate S was the first smartphone in the world to boast a 'Force Touch' display, which the firm claimed could be used as weighing scales for everyday items (such as an orange, in its demo), but realistically it didn't work all that well. As Kottmann states in the tweet, the exact details around how Deep Press will work are unclear. Will Android manufacturers need to add press-sensing hardware to up-coming devices, or will the tech instead use machine learning to calculate the force being applied to a screen? 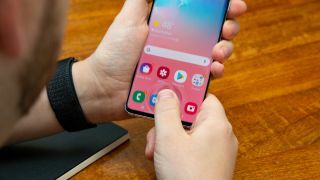 If it's the latter, then the feature could feasibly roll out to all Android handsets with the Android Q update, while the former would mean only new smartphones with the specific hardware will be able to take advantage of it. We may learn more about Deep Press next month at Google I/O (May 7-9), where the search giant usually lifts the lid on the new features planned for its next Android update.